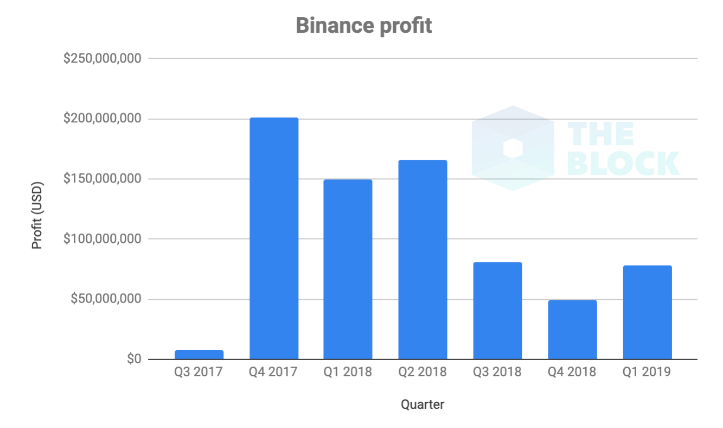 After recording profits of $446 million in 2018, slightly below Changpeng Zhao´s expectations of $500 million, Binance is staying on the green side on the first quarter of the year, and appears to be increasing its benefits. Despite CZ having predicted that $500 million would be the minimum profit for 2018 (in a wide range which went up to $1000 million, in the CEO´s opinion from last July) the final result can not be taken as a negative one, in light of the bear market that plunged prices of BTC down 80% from all-time highs. The tendence of quarterly profits reflected at the end of last year was a clearly descending one, down from about $150 million in each one of the first two quarters of the year to $80 million in Q3, and finally a bare $47 million in Q4. Now, that trend appears to be retracing, with the sudden increase in profits in the first quarter of 2019 reaching $78 million and thus exceeding in 66% the same metric for the previous term, as reported by Coinbase funded crypto media The Block. Do you think Binance will reach $1,000 million in profits this year?